Wasps and mud daubers are both members of the Apocrita sub-order of insects and are closely related in many ways. Both insects are parasitic and are important pest control agents throughout their range. There are, however, differences between wasps and mud daubers regarding their appearance, behavior and reproduction that makes it easy to differentiate between the two insects. Wasps often live in social collectives unlike mud daubers. One of the primary differences between wasps and mud daubers is their size and shape. Mud daubers tend to be larger but more slender than wasps. Mud daubers have a long, narrow petiole--what entomologists call the portion of the body that connects the abdomen with the thorax. In addition, although both wasps and mud daubers have a black and yellow colors, those of the mud dauber are more subdued and less noticeable than wasps. Mud daubers are solitary insects while many species of wasp are social and live in large hives. Mud daubers collect mud from the ground and construct tubular nests under an overhanging structure, such as an awning or a deck. They then hunt a variety of insects, fill the tubes with the carcasses, lay a single egg and then seal the nest and leave their offspring to develop on their own. 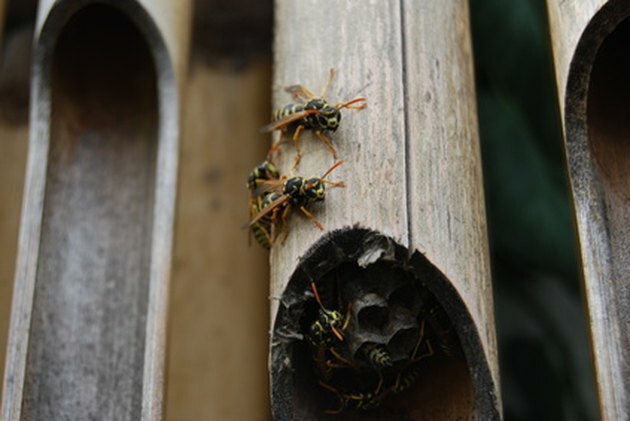 Wasps, on the other hand, live collectively and construct large nests from wood fibers combined with their saliva. In these nests, larval wasps are cared for and protected by adult wasps. Wasps construct nests underground as well as above ground, depending on the species. Because of their solitary nature, mud daubers are not an aggressive insect and will only sting if persistently provoked. Mud daubers do not defend their nests, even during the construction. Wasps, if threatened, will fiercely defend their nest. Wasps posses an unbarbed stinger that allows them to sting multiple times and they will often bite and sting simultaneously when agitated. Damien Campbell has been a professional writer since 2010. He is a regular contributor on home and garden topics and writes about his travels in Sweden for various websites. Campbell holds a master's degree from Lund University in sustainability science and specializes in writing about landscape design and natural history. Why Are Bees Attracted to Porch Lights?